DXA Scans: Largest, Smallest and Mermaids? As I look back over 30 years of DXA research, I am amazed at the wide range of shapes and sizes scanned in our lab. This includes athletes, infants, knee and hip replacement patients, cancer survivors, spinal cord patients, and many more. Here are some fun highlights of scans conducted, which include the largest, the smallest, and even a mermaid. Two DXA scans qualify as the largest DXA scan done in our lab. Both DXA scans were done on individuals 18 years of age. In terms of size, the largest person we have scanned was 6 feet 8 inches tall, and weighed 419 lbs. This height and weight gave this individual a body mass index (BMI) of 46.0 kg/m2, which is considered obese. However, when we looked at his scan, he had a total percent body fat of 35.2%. What is amazing, is that, at 18 years of age, this individual was probably still growing. In comparison, our lab scanned an individual that was 5 feet 3 inches tall and weighed 300 pounds. This gave this individual a BMI of 53.1 kg/m2, which is in the obese category, by BMI standards, and they had a total body fat of 61%. Interestingly, this person underwent bariatric surgery, and 1 year post-bariatric surgery, the total percent body fat dropped to 41% (BMI=36.1 kg/m2) after a 100 pound weight loss. The smallest DXA scan done in our lab, in terms of total percent body fat, was on an individual who was 6 feet 1 inch tall and weighed 185 pounds with a BMI of 24.4 kg/m2, which is almost in the overweight category for BMI (overweight BMI is 25-29.9 kg/m2). However, their total percent body fat was 7.0%. Although lower total percent body fats have been reported using other methods, which we discussed in a previous blog, this is very low for a DXA determined total percent fat. In contrast, the smallest human scanned in our lab was a 5 months old infant who was 24.5 inches long and weighed 12.2 lbs. This little person had a total percent body fat of 28.2%. DXA scanners are not only used on humans, but also on animals as well. Our lab has conducted studies using DXA scanning on rats. On average, these Norwegian Brown rats had a weight of 1.05 lbs. and a total percent body fat of 35.9%. Rats are not the only animals to undergo DXA scanning. Cats, dogs, swine, sheep, mice, birds, etc. have also been scanned. DXA scanning of animals is often done for research to investigate new drugs, new types of replacement materials, etc. Animal food companies also scan animals to examine the effect of certain food mixtures, and its effect on body composition. 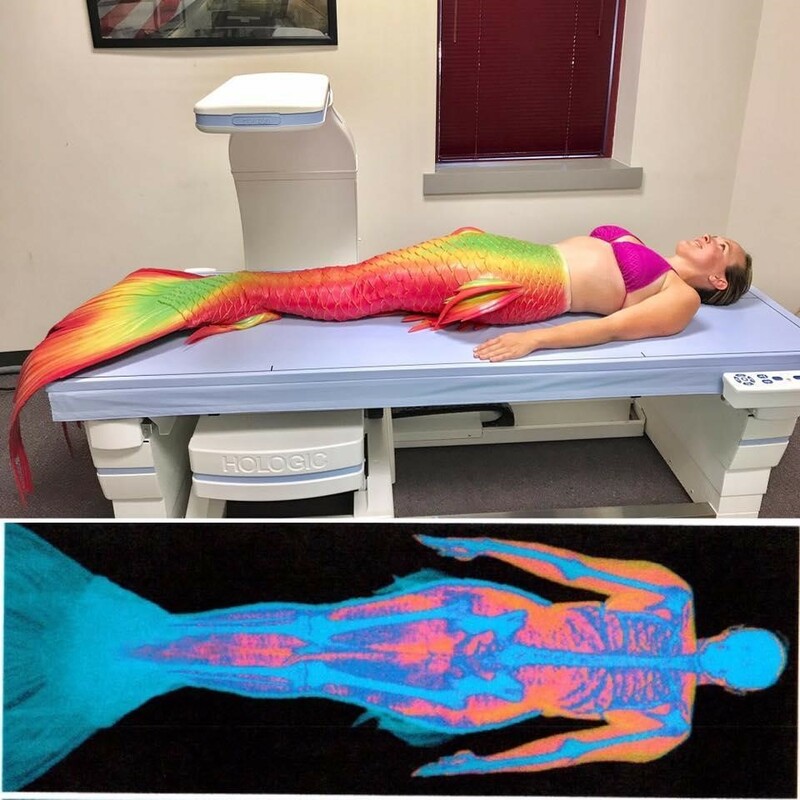 Last of all, the most unusual DXA scan was on a Mermaid. You may ask, “Why scan a mermaid?” The obvious answer is, “Why not?” Truthfully, I was interested in the mermaid’s tail, and what the DXA would do with the material the tail was made of. As you can see from the photo below, the bones of the legs are still visible inside of the tail, but the feet almost blend into, what appears to be, the fluke of the tail. The tail is actually made of high performance platinum silicone and weighed 24 lbs. The DXA scanner detected an additional 17.3 lbs. from the scan of my mermaid both with and without the tail. The tail added an extra 24.22 lbs. of fat-free mass, and reduced the fat mass by 6.92 lbs. The change in fat and fat-free masses, due to the tail, resulted in a reduction of 8% in total body fat. DXA scanning can be used for many reasons and across many populations. My lab has used DXA for medical, research, and, of course sports performance studies. We’ve scanned infants, animals, athletes, and mermaids. Ultimately, for me, it comes down to isolating the individual components that accumulate to body mass, and gaining deeper understandings of how those individual components translate to performance. DXA technology is the only method I’ve shown to be reliable and replicable in terms of trending an individual over time and comparing individuals to one another.